iThemes Sync Pro brings WordPress performance monitoring and WordPress site maintenance together in one convenient dashboard. With iThemes Sync, you can manage updates (and more!) for all your WordPress sites from one place, so you don’t have to log into multiple websites to make sure your WordPress sites are up-to-date and running smoothly. With Sync Pro, you can view uptime and performance statistics and get notified if your site goes down. Average response times (in milliseconds) from various global locations – View average response times and a list of countries with uptime performance based on real data from actual visits to your site. 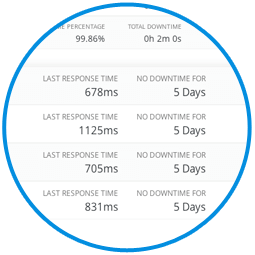 Performance history – see a summary by date of uptime percentage, total downtime and average response time. With a Sync Pro plan, you get access to all the time-saving features in Sync plus pro-only features like Performance Monitoring, Uptime Monitoring, Client Dashboard and more. Click the Uptime tab in the left-hand navigation menu in the Sync dashboard. Click the Add + tab. 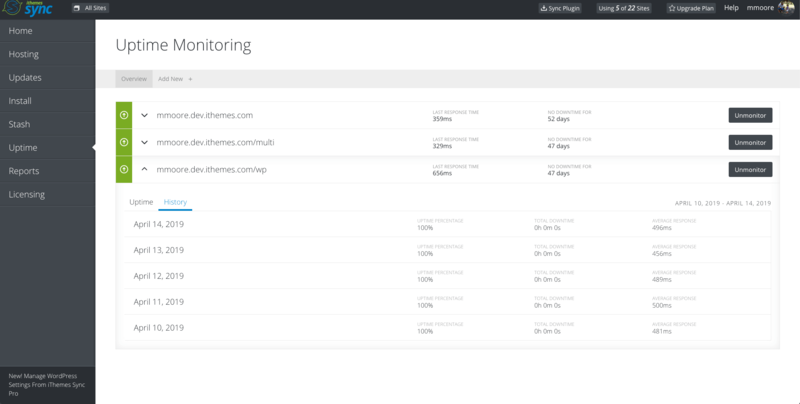 Select from the list of your Sync sites to add to uptime monitoring. Sync will then go to work monitoring your WordPress site’s performance and uptime. You’ll be able to view stats and a visual of your site’s performance data from the the Uptime tab. Click any site in the list to display the details. If you’re managing WordPress sites professionally and need WordPress performance monitoring, check out iThemes Sync Pro. Sync Pro is designed to help you offer monthly WordPress maintenance packages to your web design clients, showing all the work you did to keep their WordPress sites running smoothly.